List of website maintenance details that one must keep a check on. HomeWeb DesignWhat should website maintenance include? Hybrid apps; Reasons for their popularity and demand. 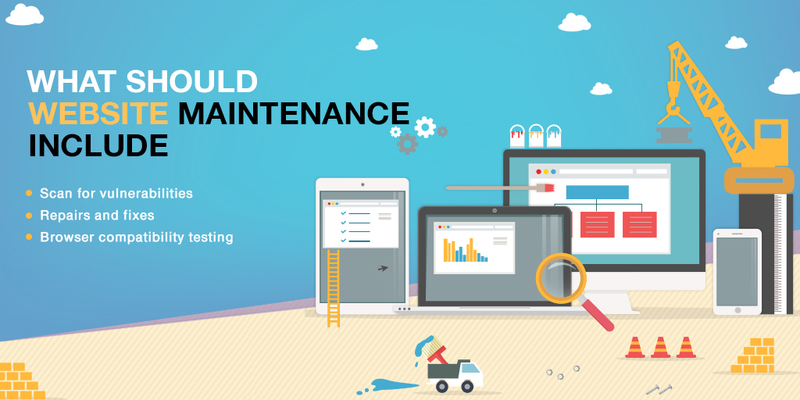 What should website maintenance include? Mostly there is a big sigh of relief once the website is completed and uploaded but wait, do you actually think that it is done forever? NO, just like your car, your body, your house, even your website needs maintenance on a periodic basis. Many people think that website maintenance is majorly about fixing the bugs that pop up after launching it but actually, it encompasses a lot more. Upgrading the website’s visual branding, integrating with new systems and updates or uploading fresh content is all part of maintenance. A website is the first impression of your business and this needs to be in line with the constantly evolving environment around you in order to not fall behind in the competition. Here is the list of website maintenance details that one must keep a check on. Scan for vulnerabilities: Security should be the primary reason for the maintenance of the website. Check for the spams that may have surpassed your filters. Scanning for vulnerabilities regularly assures that your website is not attacked or taken over. Repairs and fixes: This is all related to errors, bugs, and broken links. Both internal and external links should be checked. A link checker can be run to look for broken links that frustrate the users and reduce the search engine rankings. Browser compatibility testing: Ensure that all aspects of your website are functioning properly in the most common browsers. Your website must also be compatible with less used browsers. Software update: The critical software your site relies on should be updated. Example; the content management system, their themes and plugins. Also, upgrade non-critical software if they are worth applying. Website backups: The database backups would be automatically performed on weekly basis and restored at least once in every six months. Site speed: This is a very critical point to check. Use Yahoo’s YSlow or Google PageSpeed Insight to identify the issues which are slowing your site’s speed. Search engine optimisation: With SEO you identify the issues which are affecting the ranking of your site. Analytics: Through Google Analytics dashboard, check the important metrics of your site and the trends in those key metrics. Functionality: Check all the important functionality like filling up signing forms, contact forms, checkout forms etc to ensure that everything is working smoothly. Website content: A fresh and updated content on websites is what users and search engine like. Therefore regularly review your content, correct the mistakes, and upload the new information with targeted words in a fresh style. Well, these are the basics of maintenance. A business may go deeper into it, based on his website but must not ignore it. Nurturing and maintaining the website is the simple funda for online success of a business. Maintenance really ensures the website’s performance at peak by removing errors, security issues and delivering the best user experience to the customers.